The premise behind it is that everyone carries around an invisible bucket (my kids say it’s in our bellies…not sure but works for me). The bucket is for holding good thoughts and feelings about yourself. And when your bucket is full you feel very happy and good about yourself. You fill a bucket by saying kind words and do nice things for others. When your bucket is empty, you feel sad and lonely. You can dip into or empty someone’s bucket by doing the opposite. The biggest part of the lesson (in my opinion) is that when you fill someone else’s bucket you fill your own as well and vice versa. When you dip from someone’s bucket, you dip from your bucket too. Love, love, LOVE this message and the fact that it is written in a way that even my two and a half year old (sort of ) understands. 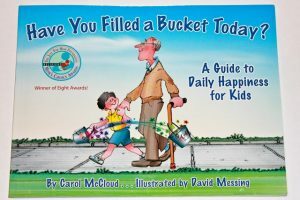 We read this book quite often and will brainstorm ways we can fill not only each others’ buckets but other peoples’ as well and then we challenge each other to be the best bucket fillers we can each day. This was working well, so I decided to take it a step further. And a cute little jar that I already had. This jar is used to hold our good thoughts and feelings (or as we call them “warm fuzzies”). Then I came across a cute printable and had my oldest beautify it with markers. You can print a copy of it here (along with others). I drew 10 hearts on the bucket and cut the page down to fit inside a picture frame I had on hand. I really like this idea because not only is it promoting “niceness” in our house but they are working together towards a common goal. And the reward is…..SPENDING TIME TOGETHER! !